Go on-be honest. What do you think? 100? 500? Surely not more than that! After all you are a mindful massage therapist, right? Would it shock you to know that the AVERAGE user in the UK touches their smartphone over 2,500 times per day!And that’s just the average user –the heavy users amongst us (probably all of those running our own businesses) are proper addicts with 5,400 touches per day. And that is just your phones. Add to that computer use, tablets, a love of gaming and you start to have an idea about the amount of time per day we spend staring at screens, tapping and clicking, swiping and surfing…. We are all addicts and we don’t even realise how much this new lifestyle is taking its toll. Reliance on technology is negatively affecting us on every level –mental, physical and social. Yet with every problem comes an opportunity. Our dependence on technology means that the general public is hungering for the very genuine and vital form of communication provided by massage therapists via the medium of touch. Technology is causing us real problems and the informed and skilled massage therapist is ideally placed to “reach out and touch someone” as the song goes! Research is increasingly showing us that our over reliance on technology can have serious effects on our psychological feelings of well-being. In particular our brains have just not evolved to cope with the amount of information they are trying to absorb on a daily basis. Our constant checking of our phones or emails is in effect training our brains to be permanently distracted. This has serious knock on effects for our ability to think and concentrate. The constant restlessness and distractibility of the average technology user is linked to increased depression, anxiety and–in the case of gamers-aggression. It is also affecting our ability to be contemplative, to engage in the kind of free floating imaginative thinking that is conducive to imagination, new ideas and relaxation. Worryingly it is also affecting our ability to be empathic –to tune into what others around us are feeling. You have probably experienced this yourself at some point –maybe when you were baring your soul to a friend or family member only to have them glance distractedly at their bleeping phone as you were speaking. So what does this have to do with you as a massage therapist? As the habits of technology take their toll, people everywhere are starting to recognise and pay for the privilege of literally being “switched off”. Retreats are proud to advertise themselves as “unplugged”, mindfulness courses are everywhere and stressed out hipsters are reverting to their “unsmart” Nokias to try and stem their addictions. You too can capitalise on this trend whilst genuinely helping others. Massage can do so much to ease the stresses of modern daily living. Providing time for your clients away from their technology is becoming increasingly precious. Make sure you let people know in your advertising the beauty and benefit of what you provide. We have probably all heard about carpal tunnel syndrome but how about blackberry thumb, gamers wrist, ravers wrist, Rubiks wrist and stylus finger? Today’s world necessarily involves a staggering amount of activities that require the day to day use of our hands and arms, not just for work but leisure time too. This inevitably leads to pain and injury as our poor limbs and digits beaver away to try and keep up with the ever increasing demands of our techno driven lifestyle. Stop and think for a minute about what you have done today-answered some emails, texted a few personal and business associates, surfed the web for that new holiday and this is even before you have embarked upon your incredibly hand intensive occupation of massage! It’s not surprising that repetitive strain injury (RSI) is one of the biggest causes of time off work in the UK. The health and safety executive estimated that in 2017/18approximately 197,000 people in Great Britain suffered from an ULD (upper limb disorder).This caused a loss of 2.6million working days. The good news-massage therapists can be the experts! The good news is that massage therapists and other bodyworkers are ideally placed to treat these conditions as they usually stem from overuse of soft tissue structures (combined with other psychological and social factors). Many conditions can be resolved within 1-6 weekly treatments with a combination of trigger point work, myofascial release and appropriate stretching techniques. Other conditions may need a longer period of gently supporting the body back to health; again massage therapy can be the key modality to promoting healing. Imagine the impact on your business through being able to treat these conditions confidently and successfully. I have had excellent results in my own clinic in treating these disorders and in many cases have been able to help clients avoid surgery or more invasive medical treatment. 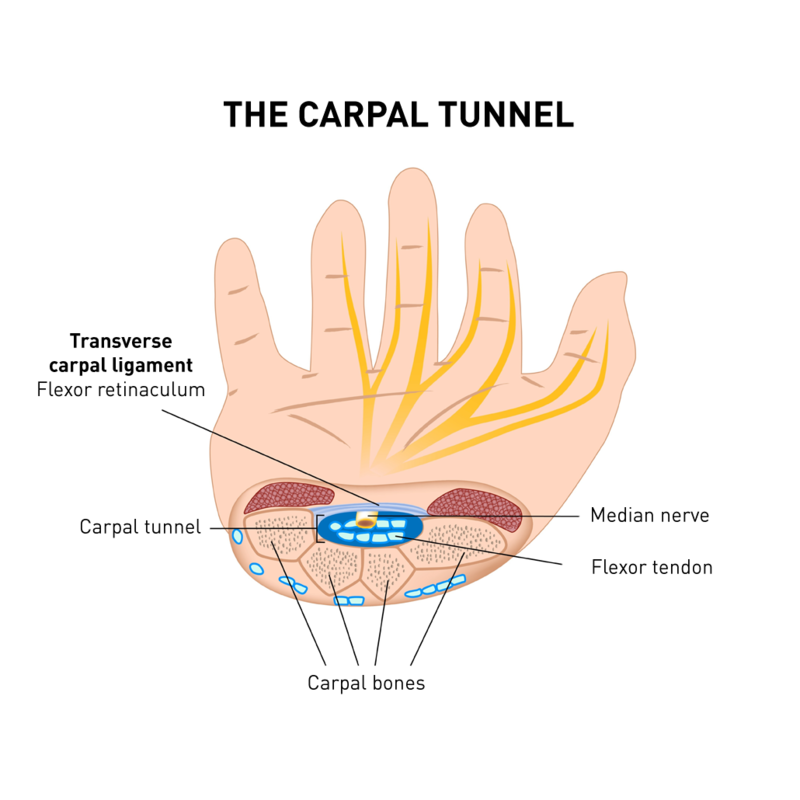 The carpal tunnel is an oval passageway created by the structures of the wrist. 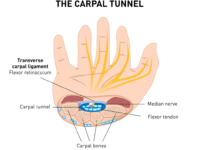 The carpal bones create the bottom of the tunnel and the transverse carpal ligament, also known as the flexor retinaculum, forms the top of the tunnel. (FIG 4).In each individual, the carpal tunnel is a fixed space although it can vary in size from one person to the next. The median nerve: This is one of the three nerves that innervate the forearm and hand: the other two are the ulnar and the radial nerves. Loss of function of the hand if severe and not treated. Untreated CTS can result in permanent nerve damage, as nerve tissue cannot regenerate. Treatment tips: Orthopedic tests can help you determine whether the entrapment is at the carpal tunnel or from other soft tissue structures. Treat the wrist flexors, extensors and include the cervical and shoulder girdle area with advanced soft tissue techniques such as trigger point and MFR. Use fascial techniques around the palmar fascia and wrist to release pressure in the carpal tunnel. The brachial plexus is a network of branches of spinal nerves C5-T1. If you look at an anatomy book you will see that the brachial plexus passes not only between the scalene muscles in the neck but also between the pectoralis minor (deep tothe pectoralis major in the upper chest) and the ribs. It then branches into the nerves of the arm, the most important of which are the radial, median and ulnar nerves.So what do you think might happen if the scalenes or the pectoralis minor become tight as they are very likely to do from our habitual rounded shoulder/ head forward position of desk and computer work? That’s right! Use trigger point and myofascial techniques to release myofascial restrictions in the tissues –focus on scalenes and pectoralis minor. Advanced stretching and soft tissue release will enable the tissue to return to a normal resting length and minimise the risk of compression. Overuse Syndrome and Repetitive Strain Injury (RSI)Over-use injuries are often of slow onset; you start to get some pain, you ignore the pain and keep typing or massaging, re-injuring the tissues, causing more tissue damage. (FIG 7)Tendons become irritated, the repetitive stress causes micro tearing of the muscles, leading to inflammation and scar formation. In the early stages of injury the pain may be mild and only when doing the offending activity. Eventually without intervention, the severity of the pain increases and may also be present at rest and during other activities such as writing, picking up a kettle, carrying a bag or picking up a child. It is important to realise that RSI is usually associated with other psychological and social factors such as feeling out of control at work or overwhelmed. In my clinical experience, hand and wrist pain that results from long term overuse usually needs a more gentle and long term approach. Gentle myofascial work combined with craniosacral therapy seems to get better results than intensive trigger point work as the body can be very sensitive. Check in with your client at each session about whether they experienced any post-treatment discomfort and modulate your techniques accordingly. Treatment Tips: Traditional tried and tested methods for tendinopathies including “blackberry thumb” include myofascial and other soft tissue work to the corresponding muscles and cross fibre friction to the irritated tendons. Use supportive nurturing work like Swedish, hot stone and cranial work. And don’t forget our old friends-Trigger Points! The informed massage therapist will never forget that chronic pain patterns are often caused by trigger points. Incorporating trigger point therapy into your massage work will enable you to provide dramatic relief to many chronic pain conditions -hand and wrist problems are no exception. Very often myofascial trigger points are the sole cause of pain, numbness, tingling, stiffness, burning or swelling in the hands and fingers. Rachel Fairweather is author of the best selling book for passionate massage therapists –‘Massage Fusion: The Jing Method for the treatment of chronic pain”. She is also the dynamic co-founder and Director of Jing Advanced Massage Training (www.jingmassage.com), a company providing degree level, hands-on and online training for all who are passionate about massage. Come and take part in one of our fun and informative short CPD courses to check out the Jing vibe for yourself!Rachel has over 25 years experience in the industry working as an advanced therapist and trainer, first in New York and now throughout the UK. Due to her extensive experience, undeniable passion and intense dedication, Rachel is a sought after international guest lecturer, writes regularly for professional trade magazines, and has twice received awards for outstanding achievement in her field.Rachel holds a degree in Psychology, a Postgraduate Diploma in Social Work, an AOS in Massage Therapy and is a New York licensed massage therapist. www.jingmassage.comTel: 01273 628942Copyright Jing Advanced Massage January 2019.